Sony, like every vendor on the planet, is hotter on 4K TVs than ever. 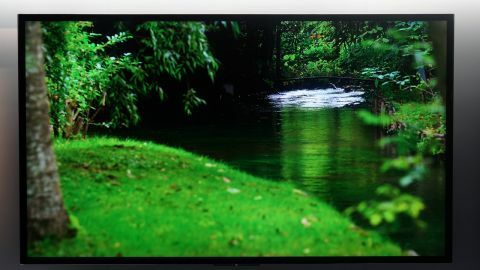 The company showed off its latest flagship 85-inch, LED Ultra HDTV during CES 2014: the XBR-85X950B. So, we're just going to call it the XBR-85 from here on out. Cool? Cool. What's admirable about Sony's approach is that the Japanese vendor isn't interested in making the biggest or most bendable 4K TV – it actually wants to sell more of them. (Not to mention both to a wider range of people and sooner rather than later.) That philosophy comes through as crystal clear as does the picture through the XBR-85. It's four times the Ks! Sure, this might be the biggest and baddest in Sony's XBR range, but it's the unique features that make Sony seem closer to achieving 4K as a mainstream reality. But before I go on, "4K" amounts to a 3840 x 2160 resolution, or roughly 8 million pixels. Just throwing it out there. When you have a picture this big and this crisp, pure pixel pushing isn't enough. That's why Sony introduced X-tended Dynamic Range PRO display tech a while back. This dynamic range technology effectively and – wait for it – dynamically reduces and increases the brightness of each LED behind the panel constantly. In doing this, XDR PRO allows for deeper blacks and brighter colors, and it shows. Couple this with Sony's more recent Triluminos technology, which – simply put – widens the color gamut for better overall color accuracy, and colors on the XBR-85 look terribly close to the real deal. On the show floor, a sample TV equipped with Sony's new all-chrome four legged stand played a video of a female vocalist in a red dress. The blacks made it tough to see where the TV's bezel began, while the red dress was incredibly intense. No 4K content? No problem ... right? Sony has introduced X-Reality Pro, it's own native upscaling tech, to its XBR range of 4K TVs. Obviously, the idea here is to help soften the blow of watching full HD content on an Ultra HD set. For that alone, I commend Sony for trying. Can't see the bezel either, can you? However, I get the feeling that X-Reality Pro isn't all that it's cracked up to be. In a demonstration of the technology in action, two models of the XBR-85 were playing the same video. One was upscaling a 2K video (between 2560 x 1440 and 2560 x 1600), and the other wasn't; the difference was immediately obvious. Keep in mind that this is because the source file is closer to the resolution of the screen. Try this from a 720p (like all broadcast and cable TV) or even 1080p content source, and the effect will not be as great, a Sony representative admitted to me. That sours the effort quite a bit. The Triluminos and X-tended Dynamic Range PRO working in tandem is a sight to behold. It makes me excited for when 4K content finally catches up, which Sony is working diligently on. You can expect to see this 4K TV in stores this spring, though pricing was naturally left in the dark. For the moment, the XBR-85 remains an incredibly niche product that's trying its damnedest to get into more living rooms … giant living rooms.